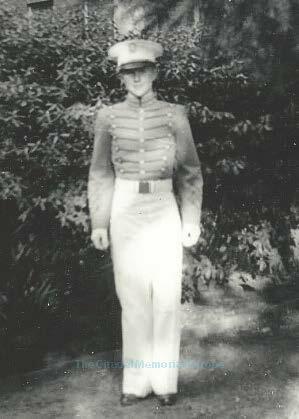 Cadet Recruit (freshman) Charles “Chuck” Marion Thirlkeld, Jr., Class of 1944. Photo courtesy of the Dworschak Family. “I just saw the Citadel Memorial page on Facebook. Thanks to you and all the others who put this together. We must never forget the sacrifices that were made to protect our freedom. As I was browsing through the list of names of Citadel grads that made the ultimate sacrifice, I noticed Charles Marion Thirlkeld. About five years ago, my younger son (now 17) and I had been watching the Band of Brothers series on TV. His favorite soldier in Easy was Buck Compton. He just thought Buck was cool. After searching the internet, I found that Buck was alive and living in Washington State. My son wanted to write him a letter and tell him “thank you” for his service and let him know how much he admired him and his fellow soldiers. Somehow, I found Compton’s address and my son wrote and mailed him a letter. In the letter, he mentioned that his Dad (me) graduated from The Citadel. Well, about two weeks later, Buck Compton sent a very nice reply to my son. In the letter he mentioned that one of his friends in Easy Company was Lt. Thirlkeld from The Citadel. Thank you for your very kind letter. I am happy that you enjoyed learning about our division. We only did what is to be expected from any loyal able bodied American male. I am impressed that your dad attended The Citadel. That is a great institution which turns out great officers and patriots. Your dad might be interested in the fact that after Holland and before Bastogne a young lieutenant named Charles Thirlkeld joined our outfit. He had served on the staff at SHAEF Hdqs. Both he and his father were graduates of the Citadel. Steve Smith, Class of 1984, helped me with fact checking. It is understandable that after so much and so many years, Buck’s memory of Chuck had blurred. Unfortunately, Chuck did not graduate from The Citadel. Chuck transferred from The Citadel in January 1942 after successfully completing three semesters. He then attended Louisiana State University where his father, an Army officer, was an artillery instructor. Chuck enlisted in the Army later that year at Baton Rouge. Also, there is no record of his father having attended The Citadel. However, Col. Thirlkeld personally knew General Summerall having served with him in Hawaii during the 1930’s. General Summerall was President of The Citadel from 1931 to 1953. Chuck did serve at SHAEF Headquarters in England before transferring to the 101st Airborne Division. More background can be found in an earlier post – Lt. Charles M. Thirlkeld ’44, 506th PIR, Easy Company and on his In Memoriam page. Having completed his freshman year at The Citadel, Chuck was a Citadel Man. On January 3, 1945, he was killed in action in the Bois Jacques near Foy, Belgium while he was the platoon leader of the 506th’s 2nd Battalion Anti-Tank Platoon which was attached to Easy Company at that time. He now rests in peace at Luxembourg American Cemetery where fellow Citadel Men Theodore Hanford, Class of 1942, and Harry Bell Launius, Jr., Class of 1946 are also interred, and James Goodlett Thornton, Jr., Class of 1940, is memorialized on the Wall of the Missing. Buck Compton returned home to California after the war. He earned his law degree from Loyola and then made a four-decades long career in public service which included leading the prosecution of Sirhan Sirhan, the man who assassinated Senator Robert Kennedy. Buck was an All-American hero, a true leader, and him saying that “The Citadel is a great institution which turns out great officers and patriots” means a lot. Great post… thanks Roger….Clark Mulligan? GO BRAVO BEACH! Thanks, Rob. Will do my best to keep them coming. Am getting plenty of new material in thanks to the efforts of some great people! Roger, reading this makes the hair on the back of my neck stand up – from awe, gratitude, sadness, pride… Andy Kullberg’s way of summarizing the whole Long Grey Line is lovely – your calling card. It is to your (all of you) credit that you assume the mantle of responsibility to uphold that high standard when you enter the LGL and that you remain willing to serve in whatever walk of life your path takes you. Thank you! p.s. I don’t care particularly for using the word “brand” to describe The Citadel; it seems too commercial and crass to me, not befitting the dignity that is due your gifts to this world. Karen, thank you for the great thoughts and challenge! I am indebted to you, Roger, for your work honoring those who trod that path before you.